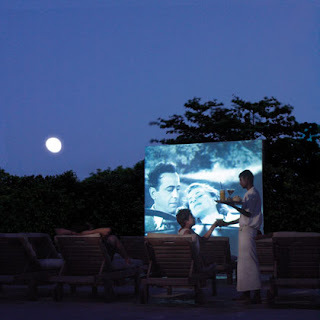 With summer beginning to wind down, I think a great entertaining idea is to host an outdoor movie night. For a project a while back, I drew an outdoor ampitheater into a space plan for a future commons area.It was perfect outdoor addition for the revitalization of an old mill town in North Carolina . The first step is to get a portable projector. There are a lot on the market to choose from.This model is by Optoma. For the screen, a simple, inexpensive white sheet will work. Then, pop some popcorn, throw in some peanut butter m&m’s, Dr. Pepper with a little cherry juice, some chairs and blankets, and you’ve got yourself a fun and memorable summer party.